by Dave from The Longest Way Home ~ October 1st, 2014. Published in: Travel blog » Thailand. Is a food court in Thailand the best place experience your first street food dish? 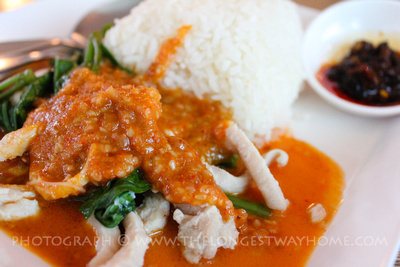 Is a Thai food court your best option to first experience Thai food? You arrive into Thailand full of excitement at the multitude of wonders it holds. From dazzling temples to world renown shopping centers Bangkok it seems to have it all. What’s more Thailand has a great reputation for food that you can’t wait to try. But once you hit the hot sticky streets of Bangkok to the row of street food carts your gut tells you to slow way down. How long had that food been there? The flies, the car fumes the heat it all goes against your best instincts. What’s more you have hard time even identifying most of the food on offer. The last thing you want is to get sick on your holiday. You could go to a restaurant, but that kind of defeats the purpose of visiting Thailand. The solution? Visit one of Thailand’s many food courts! Why? Because they are very similar to Thailand’s world famous street food vendors only safer, cleaner and they are a lot cheaper than many restaurants! What is a Thai food court? Food courts in Thailand are where several food vendors get together and offer a multitude of dishes under one roof with shared seating between them all . Most shopping centers have a food court either in the basement or on one of the upper floors. Want your first pork in peanut sauce to go with out a hitch? Try a Thai food court for good safe food. While each food court is unique most follow the same principle. A customer buys a food voucher/coupon in the food court and then uses the voucher to purchase food from any of the individual vendors in the food court. Each vendor will have their own menu and you choose from it when ordering. The food is cooked fresh and you take it yourself to the table. Change is given for your remaining vouchers back where you bought them from. Every food court in Thailand much pass a sanitation inspection which give you one more reason to try one out without worrying so much! 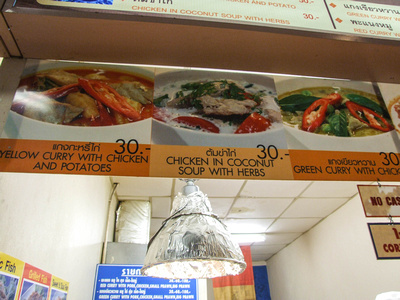 What sort of food is available at a Thai food court? It depends on the food court. In this article we’ll be looking at the Food Center in Bangkok’s MBK shopping center which is a great place to start your first Thai food court experience. There are two food courts in MBK. One on the 5th floor called the International Food Hall and one on the 6th floor called Food Center. 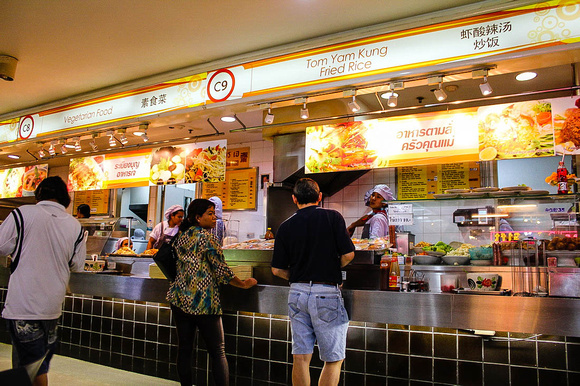 At the International Food Hall you can get a variety of food from around the world. From Indian to North American to Continental. The prices are a little more here but if you want an international choice it’s here. I recommend having a go at the Food Hall on the 6th floor. Here’s it’s where many thousands of shoppers and locals eat everyday. The food is predominately Thai. So you’ll get to see a lot of what’s on offer from all over Thailand here under one roof. Best of all it’s clean, well run and cheap! Where to find a food court in Thailand? Throughout Thailand you’ll find food courts in most of the top shopping centers and in many markets. The quality varies but you’ll get a fair idea what’s on offer by just walking around before buying a voucher. 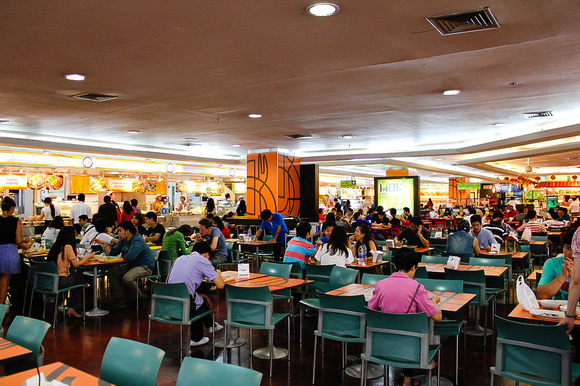 Food courts are great places to try out a wide range of Thai foods cheaply while still being clean places to dine! If you are shopping in Bangkok then these are some of the best food courts available for first timers. Central World Food Loft – Thai, Mexican, Japanese and Vietnamese dishes. Siam Center Food Republic – a modern flash food court with international dishes. Siam Paragon Food Hall – a big bustling food court surrounded by many individual restaurants in an open plan style. Terminal 21 Food Court – there’s a mix of Thai, Indian and western food here in a San Francisco Bay style layout. MBK International Food Hall & Food Island – I’ve covered these two already but keep reading for more on the 5th Food Island. Again, there’s usually a food court in most shopping centers so if you are hungry they are a good place check out! How to use a food court? I’ll be using the Food Hall/Food Island on the 5th floor of MBK as an example here as MBK is one of the most popular and easy to reach shopping centers in Bangkok Thailand. The food court is also a great place for your first foray into Thai food courts. Step 1: When you arrive at the food court you can either look around at the vendors first or buy a voucher at one of the two “Cash Card Counters” located at the start/end of the food vendors. If you are unsure how much money you need for your voucher then look around first and see the prices on various menus. Don’t worry you will get your change back when you hand back your card. 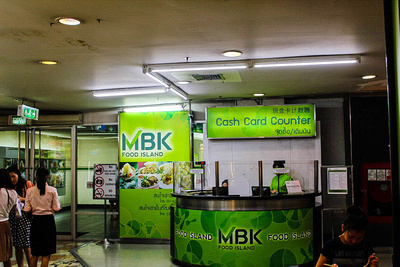 In the case of MBK’s Food Island you’ll hand over your cash and get a plastic card that’s been electronically topped up with the exact amount you gave the cashier. If you are unsure then about halfway along the food court is a scanner that will also tell you how much you have left on the card. Step 2: Locate a vendor! Walk along the food court and take look at the food on offer. There will be menus in Thai and English along with prices. A lot of vendors may not speak good English or might simply be too busy to answer any questions so do look around until you are comfortable with what you are buying. Step 3: Order the dish you want from the vendor. Either point or say a menu number next to the item you want. The dish will then be cooked or served up in front of you. Before the cooking starts you can say “No sugar” or “No MSG” or “No spicy”. Most vendors will understand what you mean! Keep in mind Thai cooked food tends to be spicy! Step 4: As your food is cooking grab a tray and cutlery. In case you are wondering the stainless steel pot of hot water is there for you to dip your cutlery into to sterilize them! Many vendors also offer condiments which you can load up on your tray too. Step 5: Once your food is cooked it will be handed to you in exchange for your voucher card. The vendor will then swipe your card and the meals set value will be deducted from it. The vendor will then hand you back you card and a paper receipt which shows the item value and the remaining value left on the card. Step 6: Eat at one of available tables nearby. Step 7: Need a drink? There are a few drink sellers located around the food court. The same voucher principle holds true with them as well. Step 8: When you’ve finish eating leave your tray behind (there are cleaners that will tidy up for you). 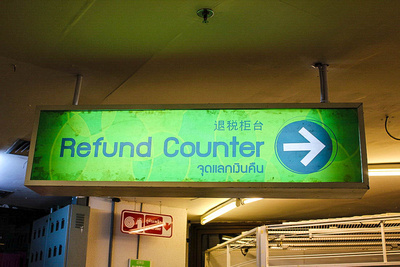 Step 9: Locate one of the “Refund Counters” to get the remaining money back from your voucher. In MBK’s Food Island they are located at the back of the food court behind some stores – follow the big green signs! In other food courts the same kiosk you bought the vouchers from usually give the cash back too. Most Thai food court vouchers are only valid for one day! So cash it in before you leave! C9 is my favorite vendor at MBK’s Food Island – this lady knows how to make great seafood rice noodles! Again, some courts operate their voucher system a little differently. Some offer little paper coupons others electronic cards. Most vouchers are valid only for the day they are issued. If you are visiting Bangkok for the first time and want to try local Thai food without the dirt, grime, heat and sanitary conditions of road side vendors then give a food court a try! You’ll be passing plenty if you are on a shopping spree in Bangkok and they really do offer great value for money while giving you a huge range of food to try out! I’ve never heard of this before. I feel like I’m missing out in one of the most important culinary aspects of Thailand! Are they just in Bangkok or all over Thailand? All over Thailand. But mainly in shopping centers and in night markets. We ate in a food court at night. Does that count :) Didn’t even know there were food markets in the malls. I think I saw one but thought it was for the staff only. Now I know! Fantastic places to eat at in Thailand. Nice post. Brought back lots of memories. Tasted by first Pad Thai at one! Strangely Pad Thai is one of the few dishes I found better in street stalls. I like food courts for wet noodles and seafood! Good grub there it seems. I find it incredible to discover so many places like this exist in the world right under our noses and we don’t know I think about them. I remember watching people wander around and try to pay in cash at a food hall once. Made be laugh. They need instructions like yours above printed out at the entrance. Ha ha! Yea I remember sitting in food courts and watching newcomers arrive not knowing what to do as well! They should read this article! Marvelous idea. I do wish more countries would adopt communal eating places like these food courts. Is it only Thai food they serve here or do they also serve International? The 5th floor international food court in MBK serves food from around the world. But on the 6th floor Food Island you can still get Indian, Thai, Western and even Vietnamese dishes. My favorite place! Get the wet noodles!